You're On Course: Golf Stars In The Suburbs. | | A Wheel Thing. You’re On Course: Golf Stars In The Suburbs. To start of, let’s look at what are Australia’s wealthiest suburbs. In NSW, there’s a few, such as Edgecliff, Rushcutters Bay, Vaucluse, Spit Junction. Victoria has St Andrews, Toorak and Hawksburn, whilst Perth sees beachside Cottesloe and riverside Peppermint Grove. In fact, NSW has six of the listings (multiple suburbs) with Victoria taking three of the other four. The guideline was pretty simple, what’s the mean incomes of the suburbs? From here, the investigation took an unexpected turn. Far from the list of cars previously mentioned, the number one car enquired about wasn’t the latest Mercedes or BMW or Lexus….step up, Volkswagen Golf! Yup, the car most enquired about in the number one wealthiest suburbs, is a German made, five door, with a four cylinder engine. The second highest income suburb, St Andrews in Victoria, had an even more surprising choice. Nope, not German. Nope, not a hatchback. 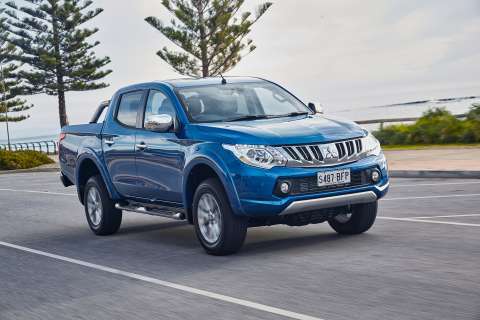 Hello Mitsubishi Triton! The next four groups of wealthiest suburbs also decided that the little car from Germany was worth enquiring about, with Hawksburn and Toorak in there, in fifth position, but semi staying to type, with the also German BMW X5 tying with the Golf. 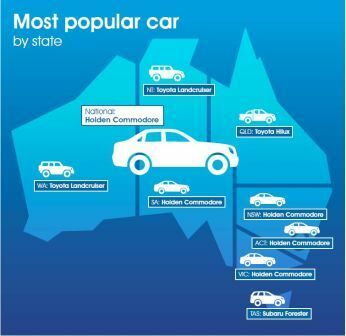 The Golf features in three of the bottom five, with tenth placed Northbridge (NSW) seeing the only British entry, with the Range Rover Sport, and seventh placed Portsea (Victoria) shunning the Golf and looking, instead, towards yet another German car, with the ML350 from Mercedes-Benz. Ninth placed Hunters Hill and Woolwich (both NSW) also stayed German, with the X5 the star enquiry. Then there’s the breakdown into the most enquired car on a state by state basis. Raise a glass to the local hero and it wears the lion…in South Oz, N.S.W., the A.C.T. and Victoria, Holden’s Commodore was the car most people enquired about. The mining money in Western Australia went to Japan, as did Queensland, with Toyota’s LandCruiser going west and north to the N.T. and the HiLux getting the sun in the north eastern parts. The “take no BS” Subaru Forester went south, tackling the Tasmanians and the broad open plains, with one section of unlimited speed on a highway, also had the big LandCruiser as the most wanted in the Northern Territory. The spread of choice in the wealthy suburbs is completely at odds with the cars of choice for the poorest, with the LandCruiser, HiLux, Prado featuring alongside the RAV4, Nissan’s Navara, Mazda BT50, Commodore and in the interestingly named Bogan Gate, the Kia Sorrento. 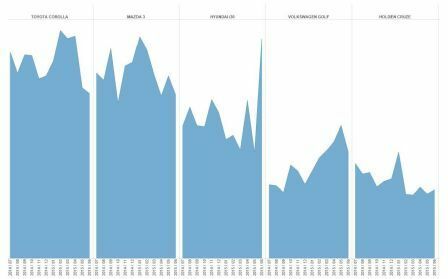 Viewing habits in regards to researching new cars also through up a surprise: Saturday is not the day to look for info, with 13.6% of weekly searches being done on that day. fast forward two and three days instead, with Monday claiming the lion’s share at 15.5% and Tuesday with 15%. 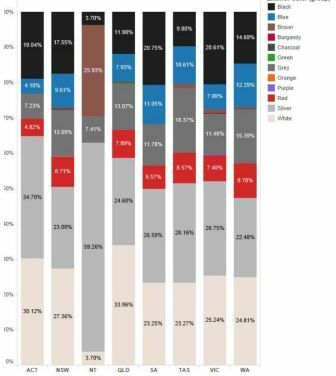 Of note was the breakdown in Golf numbers; buyers say they looked at the Golf for its size and ability to drive around town and in the wake of the emissions scandal, just 16% of Golfs were diesel…There’s also some crowding at the top of the ladder in this class, with the top three small cars (Corolla, Mazda 3, Hyundai i30) all selling from 43000 to 31000 units, whilst Golf and Holden’s Cruze sat on 20000 and 17000 for fourth and fifth. 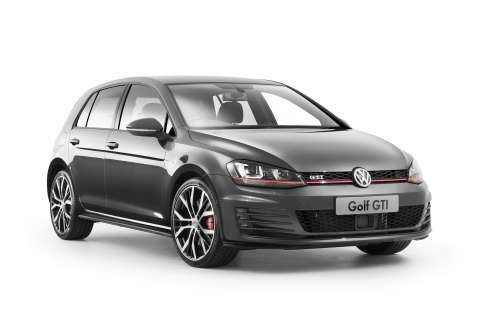 Those numbers for the Golf also have it in tenth place overall in the sales figures to 30 June, 2015. The current model Golf was launched in 2013 and is halfway through its model cycle, which may account for a monthly drop of 31 units in 2014-15 to the year before. 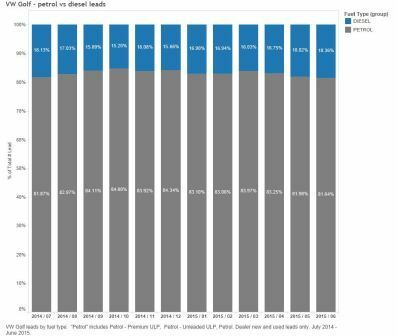 In regards to engine choice, enquiries barely varied from a ratio of 83% to 17%, petrol to diesel. So, if you’re considering “Golf”ing, you’re on course. Be the first to comment on "You’re On Course: Golf Stars In The Suburbs."